The primary difference was in fewer different tactical and strategic games (board, card, and miniatures games), from 30 and 26 in previous years to 18 in 2017. And for this I blame: Gloomhaven. We played that game so much since we got it in February 2017! If I tracked hours spent per game instead of just game titles, we would see a very different pie chart. Some 23 of these different games (52%) were new to me, I had never played them before 2017. 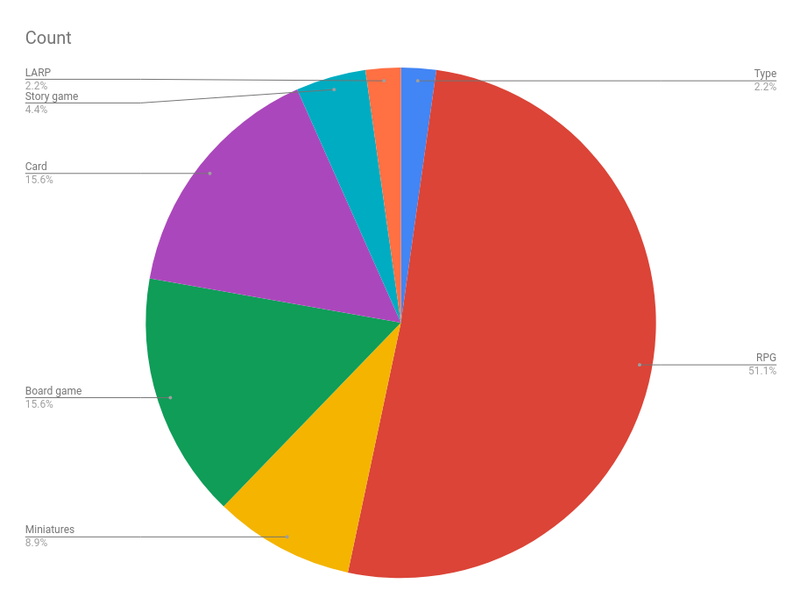 And of these new games, 7 were playtests (30% of the new games or 16% of the year’s total.) Only 5 (11%) included at least one woman or enby among the designers (Hayley Gordon, Vee Hendro, Renee Knipe, Anna Kreider, Tara Zuber, and myself) ; I remain unable to properly track other minority types. I keep being disappointed by that stat, and at Big Bad Con I ran only games that included women or enby designers, in an effort to get them better known. Among the 21 games I had played before, the average rating was 4.0 — no surprise there — with my favourites being Fate Accelerated played in the Loose Threads Fate World, and Sentinels of the Multiverse, each scoring 5 stars. Among the 23 new games, the average was nearly as high, 3.9; my favourite new games were Gloomhaven, Spirit Island, Relicblade, and Alas for the Awful Sea, each rating 5 stars, and I did not end up playing warranting anything less than a 3. That’s pretty good for new games! I played with a total of 80 different people, 44 of which were new to me (55%.) The higher number compared to the previous year’s 46 different people (with 21 new) reflects my improving health which allowed me more contacts and more convention gaming. 7 (9%) of the people I played with were under 18 (and of these, 6 were under 15), compared to only one under 18 the year before. In the future, I really want to welcome more diversity at the game table and share this hobby which has been so generous to me. Posted on January 2, 2018 January 9, 2018 by Sophie LagacéPosted in games, rpgsTagged BigBadCon, board games, card games, friends, games, Gloomhaven, illness, KublaCon, miniatures games, rpgs, statistics, tabletop.